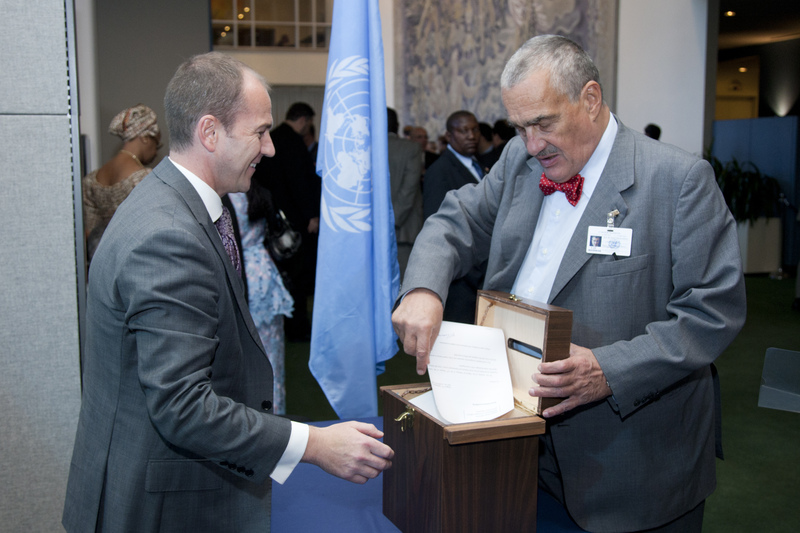 The Secretary-General launched the idea of voluntary pledges to strengthen the rule of law at the national and international levels in the lead up to the High-level Meeting of the General Assembly on the rule of law at the national and international level. Member States and other actors were invited to make individual or joint commitment with the aim of catalysing progress in advancing the rule of law. On the occasion of the High-level Meeting that took place on 24 September 2012, 41 Member States and Observers (including the European Union and the International Development Law Organization) made a total of 419 specific pledges to strengthen aspects of the rule of law in their own countries, as well as to assist others in strengthening theirs. The pledges made by Member States and Observers address a broad range of issues, both at the international and national levels. A significant number of pledges relate to the ratification of specific international treaties and reviewing reservations made by Member States. Another area of much attention relates to actions supporting the International Criminal Court and the International Court of Justice. Commitments to provide rule of law assistance in conflict and post-conflict situations, to strengthen domestic judicial systems, undertake legislative reforms and fight terrorism and organised crime, are made in several pledges. Actions specific to women and gender, children and human rights in the context of the rule of law were also pledged. Full text of all pledges is accessible through the database on this page, searchable by country and by topic. The possibility of making pledges remains open to all Member States and Observers who wish to do so. For that purpose, the Rule of Law Unit maintains this online platform with information on how to make pledges, including suggestions and examples of language to best frame them. Furthermore, in order to facilitate cooperation amongst Member States and provision of technical assistance where needed, this site also includes tables which classify the pledges received to date by region and theme. Unless otherwise requested, all pledges submitted are published on the United Nations Rule of Law Website and Document Repository. The General Assembly has acknowledged the effort to strengthen the rule of law through voluntary pledges in its resolution on the rule of law at the national and international levels. In its latest resolution (A/RES/69/123) the Assembly also “encourages those States that have made pledges to exchange information, knowledge and best practices” on them. To facilitate the exchange of information, knowledge and best practices amongst Member States, the Secretary-General invited Member States to voluntarily report on the implementation of their pledges. With Member States’ consent, this information is shared through the Rule of Law Unit of the Executive Office of the Secretary-General, and made available on this website. In addition and based on the time-frames established by Member States for the implementation of their pledges, the Secretary-General also stands ready to facilitate meetings to take stock of progress in the implementation of pledges, and to share experiences and best practices. The first such thematic meeting took place in November 2014 and addressed the issue of legal aid. i) Thematic meetings at headquarters with Member States that made similar pledges, to discuss how to collectively support implementation and share best practices. ii) Technical assistance by UN field presences through advice and technical cooperation, or any other means as appropriate in each particular context. iii) Promotion of partnerships between Member States (through North-South and South-South cooperation modalities) and between Member States and other institutions or organizations, experts or any other available resources.